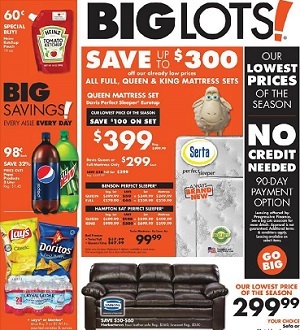 Current Big Lots weekly ad circulars, sales flyer and sale specials. Every Big Lots store ad features great savings and promotions on everyday consumables, housewares, toys and more. Check for great savings on: Simmons Harbortown Faux Leather Sofa; Signature Design by Ashley Parkton Microfiber Sofa; Simmons Velocity Microfiber Sofa; Dome Sun Shelter with Netting; Savannah Resin Wicker 4 pc Cushioned Seating Set; Char-Broil 4 Burner Stainless Steel Gas Grill; Serta Davis Perfect Sleeper Eurotop Queen Mattress Set; Dan River Reversible Microfiber Comforter; Serta 2 pk Gel Memory Foam Gusset Bed Pillows; Hoover Elite Rewind Bagless Vac; Ameriwood 6 Bin Storage Cubbies; Collapsible Storage Ottoman; Large Kitchen Storage Cart; Trent Complete King Bed; Quad Folding Chairs; Lexar 16GB Memory Storage; Simmons Manhattan Faux Leather Recliner; Ameriwood and Sauder Storage Cabinets or Wardrobe; Heifetz Sweet Pickle Relish; Heinz Ketchup; Sweet Baby Ray’s BBQ Sauce; Upton 5 pc Dining Set; and more. Big Lots stores activate their latest weekly ad every Sunday. Big Lots sells a broad range of high-quality, brand-name products, including consumables, seasonal items, furniture, housewares, toys, electronics, home decor, tools and gifts.